"It's one thing to lose weight - another thing to keep it off." There is a lot of truth to that statement. The good news is that extensive research has been done to determine what it takes to lose excess weight - in a healthy and sustainable way. Many of us have heard the depressing old wive's tale that only 5% of people who try to lose weight can keep it off. The good news is that rumor is not true! The number is a little better than that - around 20% succeed - and even better news is that we have studied those successful "super losers/super-maintainers" to find out what strategies they have in common. While individuals vary in details, there are in fact common "patterns" of behavior that the successful "elite losers" employ. Learning from their experiences can help more people be successful! The National Weight Control Registry is a great source of this information, and other studies have also provided us with key clues and tactics. While the best results of course are going to be achieved with individual counseling, treatment, and support, we would like to share some of the research so you can start thinking about what works. “... Approximately 65 percent of adults in the United States are overweight or obese. Almost one half of the adult population is trying to lose weight at any given time. Although losing weight can be very difficult, the real challenge often is maintaining the weight loss...Research has shown that approximately 20 percent of overweight or obese persons are successful at long-term weight loss...Successful approaches to weight loss maintenance include consulting with a physician, (ideally with a physician who is board certified in Obesity Medicine), nutritionist, or another support source; adhering to a stable diet with a limited variety of food (keeping things simple and choosing "easy favorites" helps with success); monitoring weight (at home or at physician's office for extra accountability); eating breakfast (higher protein breakfasts help weight loss maintenance in research); and exercising regularly (exercise must be tailored to the individual). (How success is defined, and by whom): Successful weight loss maintenance is defined as losing at least 10 percent of one's initial body weight and maintaining the loss for at least one year. The 10 percent threshold was initially suggested because weight loss of this magnitude can lead to (health benefits)...in lipid ratios (cholesterol numbers), blood glucose homeostasis (blood sugar control), and risk of heart disease, all of which have been well-documented...the definition of successful weight loss maintenance was selected based on criteria from the Institute of Medicine. We can help you with all phases of the process - setting up a healthy weight loss lifestyle strategy, supporting you while the new lifestyle becomes "second nature", and then we can help you stay on track during maintenance. It is our job to translate the science into real-life strategies that fit your unique needs and health/medical challenges. We are glad to help! 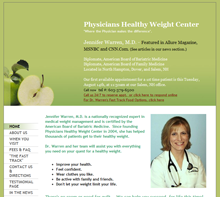 Read more about our program at healthyweightcenter.com . Call any time at (6030 379-6500. Protein and Calorie Chart: How do I get enough protein? “Doctor, how do I get 30 grams of protein at breakfast? !” A patient asked me this today, after reading about the latest research which shows that higher protein diets can help with weight loss, appetite control, and blood sugar levels. The patient realized, after a quick examination of her own breakfast, that she was getting nowhere near the recommended 30 grams of protein, and when she thought about adding protein, her calorie count was going too high... she came to the right place for help. This is what we do every day - helping people achieve healthy eating patterns that are realistic, tasty, and meet their needs for nutrition and calories. Now that we can see the research, how do we make this happen in “real life”? How can we get our protein, while controlling our calories? Below we have created a chart which shows how many calories come with 30 grams of protein, by food type. As you can see, some protein sources are a “calorie bargain” when it comes to packing a protein punch, while others end up providing too many calories if you tried to rely on them as the sole source of protein. You can mix and match different protein sources. Most of our patients try to keep their breakfast under 350 calories, and it can be far too easy to go over that goal, without preplanning, intentionally, with the facts. We can help, if you are finding it challenging to set up on your own. The good news is that once you set up a simple plan, it becomes pretty easy to stay on track! 3.http://www.sciencedaily.com/releases/2012/06/120626163801.htm Children's Hospital Boston; The study finds diets that reduce the surge in blood sugar after a meal -- either low-glycemic index or very-low carbohydrate -- may be preferable to a low-fat diet for those trying to achieve lasting weight loss.